The Porter family finds themselves flung into a dangerous prehistoric world populated by dinosaurs and while setting up a tree-house home, they adopt a baby dinosaur and are attacked by a Tyrannosaurus rex. Other than Sid and Marty Krofft, none of the creators of the original LOTL were involved in the 1990's version. Most of the outdoor scenes of the series were shot on location at Descanso Gardens in La Canada-Flintridge, California. The writers of this episode, Len Janson and Chuck Menville, were also the main producers on the series. We see the Porters' Jeep Cherokee driving along a dirt road with hills, mountains, trees and bushes all around. The scene is presumably meant to suggest that they are driving through the middle of nowhere on their camping trip. But in the very first shot, you can see a tall telephone pole in the background. We see there are a couple of bicycles strapped to the rear of the Jeep. As the Jeep falls into the ground, one shot suddenly shows the bikes missing. This shot of the falling Jeep also makes it look as if it's tilting upside-down and will land on its roof when it hits; we see it sitting on its tires though in the next shot. The earthquake, the Porter's Jeep falling through the crack in the ground, and the Porter's driving through a swirling, blue portal are meant to mimic the Marshalls' arrival in the Land of the Lost in LOTL70 (earthquake, raft falls over waterfall, they drop through the mists of a time doorway). Our vacation began, mapping out a plan. The shot of Scarface's feet tromping through the jungle is not accurate because the feet are shown too close together; in a real T. rex, the large creature's stance would have the feet about a yard apart from each other. It is obvious that the feet are actually worn by a human actor. The teaser of this episode ends in what may be a bit of an homage to the opening credits of the original Land of the Lost; Scarface looks into the camera and lets out a roar. We see that the Porter's have built a tree-house to live in. Kind of ironic that in the LOTL70 episode "After-Shock", the Marshalls reject Cha-ka's suggestion of living in a tree because a tree-house would not be very secure considering the types of threats in the Land like dinosaurs. Allegedly the series bible of LOTL90 describes Tom Porter as an architect, so presumably was able to design a strong and secure tree-house (notice that while it is constantly referred to as a tree-house in the series, it is not actually built in a tree but on top of four tree trunk support posts secured into the ground). Inside the tree-house, we see that the Porters have made bamboo cots to sleep on, very similar to the ones the Marshall's used in seasons two and three of LOTL70. 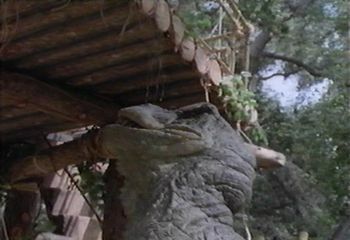 At 5:05 in the episode, a Triceratops pays a quick visit near the tree-house. In a later episode, we will later learn that this Triceratops has been named Princess by the jungle girl Christa. You can tell it's the same Triceratops by the broken right horn on her head. We see that the Porters have built a bamboo cart to haul supplies such as gourds filled with water from the nearby water hole. They have used two of the bicycle wheels on the cart. The egg the Porters discover is much too large for a real Parasaurolophus egg. While Kevin and Annie fetch water from the water hole, Tom is patching the roof and listening to oldies music on the boom box. But you can see that the boom box is not really on...the silver digital display is blank! There is a mini-windmill on the roof of the tree-house. What is it for? We are never told in the course of the series. When Scarface attacks Tom at the tree-house, we see that this T. rex is much closer to the actual size of a real T. rex than the overly-proportioned dinosaurs seen in LOTL70. Though the platform of the tree-house is made by the set designers to look on screen as if it is made of individual logs, when I visited Descanso Gardens during filming back in 1992, I could see that it was just a plywood platform painted to look like logs. At 10:33 in the episode, you can see that some nice detail went into the construction of the Scarface puppet head. There are moving arms and the eyes even blink! And there is even a tongue in it's mouth (unlike the LOTL70 puppet heads of Grumpy and Big Alice). Describing the T. rex attack to his kids, Tom mentions there was a big scar down his face. This must be the Porter's first encounter with Scarface. During the opening theme, we see the Porters on top of a cliff with a T. rex looking up at them; must have been a different T. rex...we only see the left side of it's head and Scarface's scar is on the right side. To escape from Scarface, Tom says he hit him right in the kisser with a thrown boot. That's an even less believable deterrent to a T. rex than Uncle Jack's catapulting a rock into Grumpy's face in two episodes of LOTL70! Although the tree-house appears to be complete at first glance, we see Tom doing a lot of work on it in this episode; putting palm fronds on the roof, installing or adjusting the door. In my Porter Timeline, I speculated that the Porters had just recently built it and were putting the finishing touches on it in this episode. In subsequent episodes we don't see the same type of work going on. In the scene at 21:18-21:43, we see something we never saw on LOTL70...stop-motion animation of human figures! The distance shots of Kevin luring Scarface with the dummy on a fishing pole feature stop-motion Kevin and Annie figures. When the electrical burst from the Jeep finally scares off Scarface, the animated Kevin figure is even seen pumping his fist in victory! The Porters seem to think that the electrical burst will keep Scarface away from the tree-house for a long time. I guess in the series arc it does...but it doesn't seem very realistic that such a simple scare would keep a T. rex away for long if you're in his territory. During the opening credit sequence, after the Jeep falls into the crack in the ground, the Porters land in a cave tunnel, they drive through the swirling blue mists of the portal and seem to emerge into another cave in the Land of the Lost. Then they drive out of the cave into the Land proper. Where is this cave in the Land? We never see or hear the Porters mention it in any episode. Did they return and explore for it for a way back to Earth? Is the cave near their tree-house? You'd think they'd want to stay near and keep investigating it for a return portal.